School of Seven Bells marked the release of their newest album with two sold out shows at New York City’s Mercury Lounge on February 28 & March 1, 2012). The record titled Ghostory (Vagrant Records/Ghostly International) is the third outing for the band and solidifies a style they began formulating on 2010’s Disconnect From Desire. By forging their own quite recognizable sound – part dance pop, part ethereal – they take another step away from the shoe-gaze bands they’ve often been compared. The group has juggled stage personnel around the core of songwriters Benjamin Curtis and Alejandra Deheza since the departure of Deheza’s twin sibling Claudia. In fact I’ve seen them six times with five different line-ups. While drummer Christopher Colley now seems a steady fixture, bassist Daniel is missing this time. The current configuration introduces keyboardist/vocalist Allie Alvarado. Her voice blends extremely well with Deheza’s and facilitates the live return of vocal interplay that is a hallmark of their recordings. It’s those responding and intertwining melodies that make School of Seven Bells’ songs like “Bye. Bye, Bye” so seductive. That tune in particular got a welcomed return to the set list. Alvarado has her own project under the nom du musique Painted Face, performing a brighter shade of synth pop than SviiB typically presents. Ben noted that they shared the same bill in early touring days. Alvarado’s live harmonies bring back a flavor that was really missing in performance. In fact, if she could swing the extra duties, Painted Face would make this a grand slam double bill. At the Mercury Lounge shows SviiB presented a well rounded representation of their entire catalog including “Half Asleep” and crowd pleaser “My Cabal” from their debut LP Alpinisms and Disconnect From Desire’s “Windstorm”. I attended both shows and was joined Thursday night by writer/singer Adriana Melendez a good friend who often contributes to this blog. Though she knew very little of the material in advance she thoroughly enjoyed the presentation and I think I’ve made another convert. Yay team! Even in these earliest of airings the new material worked well on stage and even got tighter from one show to the other. 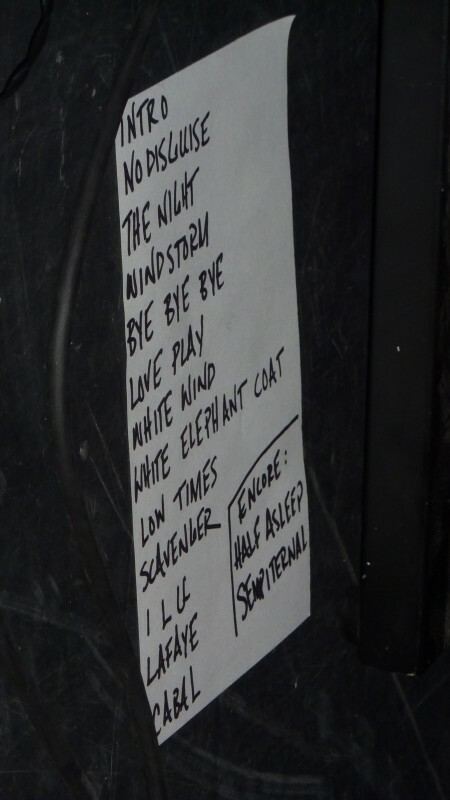 “White Wind” and “Scavenger” are particularly good in the live setting. “Low Times”, which didn’t grab my attention on record, really reveals its power in performance as the band pumps an incessant beat under Ally’s chanting. “Love Play” has a deliciously fat synth foundation and a wonderful head nodding stoner groove. I’m hoping that by time they return to New York for a show at Le Poison Rouge in May SviiB will add my Ghostory favorite “When You Sing” to the set. Mercury Lounge, and other L.E.S. venues, seem to be in “set and forget” mode when it comes to lighting these days. Positioned at either side of the stage both Ben and Allie Alvarado became poster children for the “mothers of the disappeared.” I know these are tiny rooms, I’m not expecting follow spots, but it’s hard to believe that some automated MIDI routine can’t fix this oversight. Be aware that iTunes adds the tracks “Unnature” and an extended mix of “Low Times” to the album tracks. The “Lafaye” single includes B-Side “Love From A Stone”. That makes a pretty great playlist of new material to explore. I’d also suggest you find Ben and Alejandra’s reworking of A Place To Bury Strangers’ “So Far Away” which recasts the tune in a cool Ultravox/John Foxx style groove. I’m hosting that tune as my favorite of the week at the SkeletonPete This Is My Jam Page. You can sample it for the next three days, after that you’re on your own. Lots of photos from School of Seven Bells’ August 2011 Cameo Gallery gig can be found here.